Uber and Lyft are two very popular ridesharing services in the United States. Both Uber and Lyft provide over one million rides per day. If you are unaware, Uber and Lyft is an application that you can request rides from. It works like a taxi service, but the app can track your location and provide you with a ride from the nearest Uber of Lyft driver. The difference is, an Uber or Lyft driver uses their own car instead of a company car. 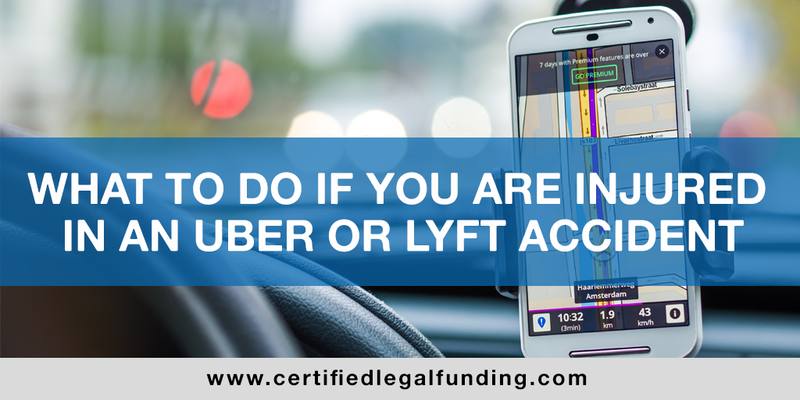 One thing many people question is – if an Uber/Lyft driver gets into an accident and you are injured – what can you do? Does Lyft cover accidents? What is the Lyft accident policy? Let’s get into it. If you are ever a passenger in an Uber or Lyft, and the driver gets into an accident it is important to try and remain calm. You should follow the same steps you would take if you were to get into an accident yourself. First, call 911 and report the accident and request medical attention if you are injured. Remember, delayed injury is common, and it is important to seek medical attention no matter how minor your injury is immediately after a crash. If you are able, it is important that you gather the necessary information you may need. This includes: filing a police report, taking pictures of the accident, and getting the contact and insurance information of the drivers involved. Once everything is completed – you need to contact either Uber or Lyft and make them aware that you were in an accident. Many people wonder if Uber and Lyft provides insurance to their drivers. The answer is, yes but drivers are covered by both their personal insurance as well as the companies provided insurance. First, it is important to know that all Uber and Lyft drivers are heavily vetted before being allowed to drive for either company. So, you can feel a bit more comfortable that every Uber or Lyft driver does have a safe cleaning record. Still accidents occur. When it comes to getting into an accident in an Uber or Lyft the passenger is almost never liable. The main issue comes down to whether the Uber/Lyft insurance policy will cover injuries or the drivers insurance (sometimes both). It is important to know that Uber and Lyft do provide coverage for injured parties up to $100,000. So, you may be wondering, who is going to cover my medical costs or more? Once you file an accident repot with Uber or Lyft the communication between insurance companies will begin. Most of the time the driver’s insurance will try to deny the claim since the driver is “hired to drive”. In this case Uber or Lyft will look into whether the App was running during the time of the crash. If it was, they will make sure the passenger is covered. If it was not they will try to avoid the claim. All in all, in this situation if you are injured and you are seeking compensation, it may be best to work with a personal injury lawyer. If you are seeking a Lyft or Uber accident settlement for your injuries, it is recommended to work with a personal injury lawyer. If you find yourself in this situation as a resident of Florida seek assistance from a top Florida personal injury lawyer. Dan Zohar is a Florida injury attorney with over 30 years of experience. By working with Dan Zohar, you have the best chance to earn the highest possible compensation. These laws and situations can be very complex so call today for a free consultation. If your bills are preventing you from filing a claim – Certified Legal Funding is here to help. Dealing with a lengthy legal process while you are covering your own medical bills can be stressful. Certified Legal Funding provides pre-settlement funding to relieve you of that stress. Pre-settlement funding will provide you with the cash you need while you wait for your case to finish. Pre-settlement funding is not a loan. If you don’t win the case, you don’t pay. Call (800) 922-7439 today!